A recent report published by Infinium Global Research on coconut fatty acids market provides in depth analysis of segments and sub-segments in global as well as regional coconut fatty acids market. The study also highlights the impact of drivers, restraints and macro indicators on the global and regional coconut fatty acids market over the short term as well as long term. The report is a comprehensive presentation of trends, forecast and dollar values of global coconut fatty acids market. According to report the global coconut fatty acids market is projected to grow at a CAGR of 4.5% over the forecast period of 2018-2024. The report on global coconut fatty acids market covers segments such as, type, function and application. On the basis of type the global coconut fatty acids market is categorized into whole coconut fatty acids and white coconut fatty acids. Whole coconut fatty acids include low IV whole coconut fatty acids and partly hydrogenated whole coconut fatty acids. Furthermore, on the basis of white coconut fatty acids the market is categorized into stripped white coconut fatty acids, low IV white coconut fatty acids and others. On the basis of function the global coconut fatty acids market is categorized into emulsifier, additives, lube and others. On the basis of application the global coconut fatty acids market is categorized into chemicals, food and beverages, household and personal care, textile and others (paint and coatings, and, metal works, etc.). The report provides regional analysis covering geographies such as North America, Europe, and Rest of the World. In this section the key trends and market size for each geography is provided over the period of 2016-2024. The countries covered in the North America region include the U.S., Canada, and Mexico; while Asia-Pacific includes China, Japan, India, South Korea, Malaysia, and among others. Moreover, Germany, U.K., France, Spain, and Rest of Europe are included in the European region. The U.S. drives the growth in the North America region as it is the largest market in the region. The Asia-pacific region offers a substantial potential for the market growth owing to rapid growth in markets such as India and China. The APAC region is projected to experience a growth at a CAGR of x.x% over the period of 2018-2024. The report provides profiles of the companies in the global coconut fatty acids market such as, United Coconut Chemicals, Inc., Guangzhou Hangsheng Chemical Industry Co., Ltd., Osky Integrated, Timur Oleochemicals Malaysia, Twin Rivers Technologies, Inc., Vantage Specialty Chemicals, Inc., Pacific Oleochemicals Sdn Bhd, Emery Oleochemicals, Chemical Associates, Inc. and Echo Chem Pacific Sdn. Bhd. The report provides deep insights on demand forecasts, market trends and micro and macro indicators. In addition, this report provides insights on the factors that are driving and restraining the global coconut fatty acids market. Moreover, IGR-Growth Matrix analysis given in the report brings an insight on the investment areas that existing or new market players can consider. 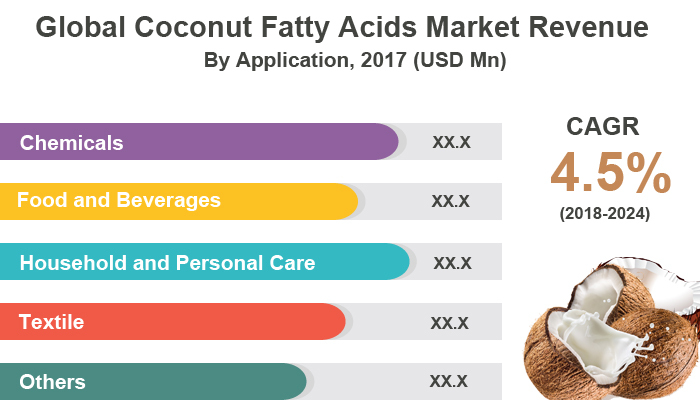 The report provides insights into the market using analytical tools such as Porter's five forces analysis and DRO analysis of coconut fatty acids market. Moreover, the study highlights current market trends and provides forecast from 2018-2024. We also have highlighted future trends in the coconut fatty acids market that will impact the demand during the forecast period. Moreover, the competitive analysis given in each regional market brings an insight on the market share of the leading players. This report will help manufacturers, suppliers and distributors of the coconut fatty acids market to understand the present and future trends in this market and formulate their strategies accordingly.